If perhaps you are a young bloodied male and typed the phrase ‘how to attract birds’ into the search engine, hit search and came across this article then you have made a slight error and maybe you should leave right now. For starters you are not going to attract birds of the type that you desire by calling them birds. Women like to be called ladies and our feathered friends have the honour of being called birds. Have you ever seen a lady with feathers?? Me neither. On the other hand, women love flowers and flowers are one of the many key points to attracting birds to the garden so maybe this article will work out for you after all. At this time of year, the sun rises and we are normally awoken and greeted with the sound of singing birds, but can you really imagine a world where that was not the case? It’s a sad fact that many of our native species of birds are at risk in the UK and it is really up to us to help save them and we can do that by starting at home in our gardens. Birds can play a massive role in the ecosystem of your garden, and no matter what area you live in, you can easily attract them to the garden by meeting their needs and making them feel at home. So herein lies the question of how do you attract a variety of species to your pride and joy? Food – It’s not like birds can pop down the local supermarket to stock up on provisions, so a variety of methods for them to obtain food will make them feel at home. The simplest solution would be to place various bird feeders in strategic positions around the garden and also away from the house. Don’t be afraid to experiment with different types of food such as fat balls, fruit and nuts as this will attract different species, in the summer drought wildlife will really appreciate anything on offer. Just like us humans, birds have preferences too. They’ll still naturally eat a slug if nothing better is on offer and what a great way to dispose of them too, without the need for any pest control. Turning your soil will loosen the ground and make it easier for plants to grow, it’ll also make it easier for worms and birds love a wriggly worm. Tip: Bird feeders are easily the most popular way to store food. Not only do they deter squirrels from stealing the food but can also be used all year round. Place these off the ground and away from nesting boxes. 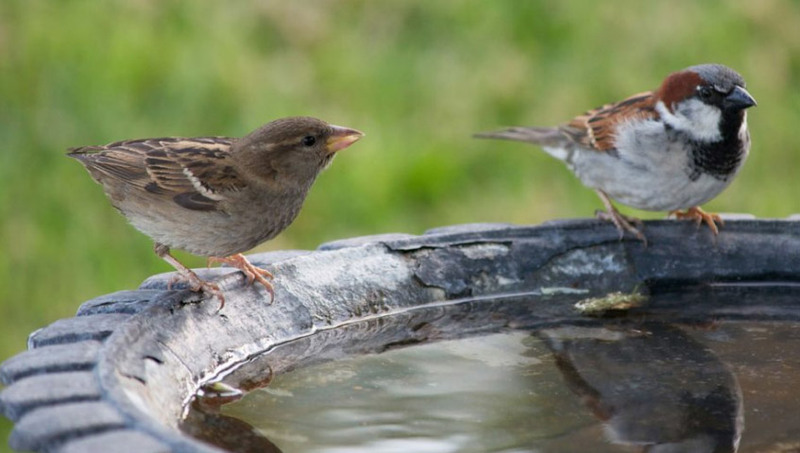 Water – Water is key to the survival of all living species and more often than not birds will have to travel great distances just to hydrate themselves. A fresh source of water will not only encourage them to visit you but they will also be able to have a bath: something that they love to do. Try not to place a bird bath in an open space where they can be a clear target from predators. The house we used to rent off a family member was a haven for birds to visit, the garden was beautiful and even had a pond with a stream and 2 rocky waterfalls. Pond plants are a lovely addition too. Watching the birds take a bath was sometimes a comical thing to see. Tip: Water is even harder to find in the winter season so keep your bird baths topped up, clean and ice free. Shelter – From personal observations , normally whilst I’m out with the hedge trimmer or leaf blower, you have may have noticed that birds can be quite nervous creatures and therefore will require various ways in which to take shelter when the need arises: whether that be for evading predators, sheltering from the elements or to simply rest, the correct position of nesting boxes will not only keep them safe but provide them with a home should they wish to take up residence in your garden. It is not surprising for birds to stay in the same area for many generations and increasing their numbers is only a good thing. Keep feeders, bird boxes and any other areas that they may shelter or live clean and easy for them to access when they need to. Tip: A bramble bush is a good way to attract the birds due to the berries being an excellent source of food for those winged wonders. They also act as a natural deterrent and a quick escape from predators such as cats who love nothing more than to chase and attack them. It’s highly unlikely that a cat or squirrel will venture to close to the prickly branches but be mindful that toddlers can hurt themselves on bramble. Flowers and Plants – To construct a garden that is bird friendly does not have to be too strenuous and making use of natural sources such as trees and bushes are an excellent way to help with the diversity of your visitors. Where there is a rich habitat, there is an abundance of fruits, insects and berries and the birds will thrive on this as it provides an excellent source of nutrition. 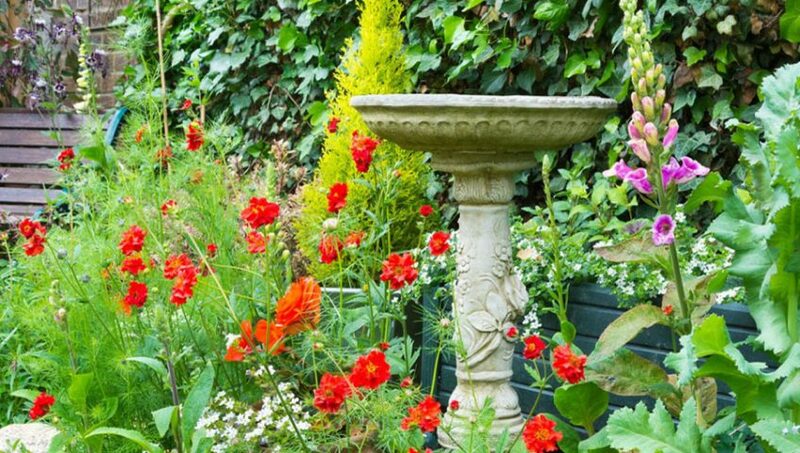 Planting a selection of wildflowers, herbaceous plants and bulbs and generally adding a bit of colour to the area will assist you greatly in captivating birds to the garden. Another method that I use every year (some of you may say its laziness) is allowing a plant, once it has finished flowering to naturally die back as this will provide plenty of seeds for them to eat, any seeds that remain, I take for free and use the next year. Tip: When creating a natural habitat, don’t be too obsessive with clearing twigs and leaves from the ground as birds will certainly make use of these in the form of making nests in and around your garden. I have never been much of a bird watcher to be honest, but I do feel very strongly about helping nature live as intended and with the world getting smaller all the time this is just one of the things that we could all do to help the survival of a precious species.